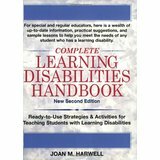 You’ll find diagnostic tools and remediation techniques for all types of learning disabilities specific interventions for specific problems strategies for building academic skills in all basic content areas and ways to improve motivation, participation, and self-esteem in even the most reluctant learner. This entry was posted in Education, Our Library. Bookmark the permalink.